February weather is harsh and depressing, but when it comes to your face, dry air can cause oily patches, clogged pores and worst of all, premature wrinkles. Bioré has got you covered with all the skincare essentials to get skin looking clear and radiant. 1. Bioré Warming Anti-Blackhead Cream Cleanser ($7.99): The ideal prep for complexion perfection is a warming cleanser that pampers skin as it whisks away buildup and oil. This cleanser is the first line of defense against clogged, congested pores contains Zeolite, a special mineral clay that warms on contact with water, and Salicylic acid, a powerful yet gentle ingredient that penetrates pores to help fight breakouts by dissolving clogged oil. 2. 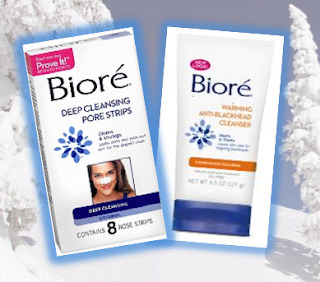 Bioré Deep Cleansing Pore Strips ($9.99 for 14 strips): Lift out any stubborn dirt and oil with the ultimate antidote to clogged pores and blackheads. The perfect final step to your cleansing ritual, the hard-working, oil-free pore strips remove deep-down dirt in just one use for a clear complexion. Tea tree oil cleanses skin and rids pores of bacteria as witch hazel reduces redness and inflammation. Menthol minimizes redness and provides a tingling cooling sensation that signals a deep clean. We will be giving away a full set (cleanser & strips) to THREE (3) lucky winners. 2. Tweet us "Clear away winter sludge w/ a skin perfecting giveaway from Biore & @mrsbeautyexpert #BIORERADIANCE, RT for a chance to win"
THE FINE PRINT: The contest will be live from 2.15.13 and ends at midnight (EST) on 2.23.13. Three winners will be chosen at random from among the entrants. The winners will be notified by a direct message via Twitter. Contest is only open to U.S. residents. Prize is valued at $17.98 each.